of Fiji judiciary triggered contempt case against The Fiji Times. WHAT an irony. The first serious test case since the Fiji regime’s draconian Media Industry Development Decree was imposed in 2010 has arisen out of a New Zealand newspaper report late last year castigating the post-coup Fiji judiciary. The Fiji Times ran the “scandalising” article unchanged the following day on 7 November 2011 and a follow-up article about six months later which also sparked a contempt charge. And the stakes are disturbingly high – the prosecution is calling for a $500,000 fine and six-month jail sentence for the chief editor – totally out of proportion to the alleged offence. At least, this was the demand by the regime’s lawyers at a mitigation hearing by Justice William Calanchini in the Fiji High Court this week. The Fiji Times (founded 1869) is the country's oldest and arguably still the most influential daily newspaper. 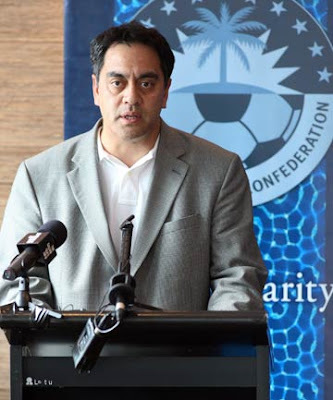 Even though both Oceania Football Confederation general-secretary Tai Nicholas, a New Zealander, had pleaded guilty last July to contempt of court for his outspoken comments suggesting there was no rule of law in post-coup Fiji reported in the Sunday Star-Times, and The Fiji Times had also been found guilty in October to contempt, the comments would clearly be regarded as normal freedom of expression in any less vindictive jurisdiction. If the world needed further evidence of how Fiji’s “chilling” legal environment has not improved for free speech in the Pacific nation in spite of the lifting of formal censorship in January, this was it. The Fiji Times legal case has rested on a mitigation defence that the contempt publication was "a mistake" – neither the publisher nor the editor were on duty on either dates of the offences. As reported by South Pacific Lawyers website, Justice Calanchini ruled in early October that former publisher Brian O’Flaherty and editor-in-chief Fred Wesley were guilty of contempt. The judge found both men liable as publisher and editor under strict liability principles. 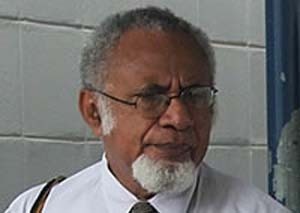 Justice Calanchini said that views attributed to Nicholas in the original article amounted to a contempt because a fair minded and reasonable person reading them would conclude that "those who claim to be performing judicial functions in Fiji are not in fact a judiciary at all” and presented a “real risk to the administration of justice in Fiji by undermining the authority, integrity and impartiality of the court and the judiciary”. Fiji has been frequently criticised in recent years for proceeding with contempt of court charges that infringe international human rights to freedom of opinion and freedom of expression. “It was entirely up to the sports editor who, due to time constraints and no show of some staff, admitted he did not read the article. “Apted says on that day the editor, Fred Wesley, was not at work. “In his mitigation submission, Apted once again asked for forgiveness from the court on behalf of his client. “He also told the court that the Fiji Times had agreed to publish an apology on the front page of the newspaper. “The Attorney-General’s office proposed that a $500,000 fine be imposed on the Fiji Times Limited and a six-month imprisonment term for its editor-in-chief Fred Wesley. • pay no less than $500,000 within a period of time deemed appropriate by the court. • the owners and directors should enter into a good behavior bond of $500,000 suspended for two years because the company was a repeat contempt of court offender." Sharma told the court that the contempt was the result of a “gross negligence and recklessness” by the newspaper. In spite of the contempt proceedings, Andrew Walshaw reported last December that Tai Nicholas had been given a place in one of the International Football Association Federation’s (FIFA) four anti-corruption panels. “The New Zealander has been given a place on FIFA's Revision of Statutes Task Force entrusted with reviewing the rule book as part of FIFA president Sepp Blatter's cleanup campaign. A Fiji government statement said at the time: "The Attorney-General views these comments as scandalising the courts in Fiji, in that they are a scurrilous attack on the judiciary, thereby lowering the authority of the judiciary in Fiji." Rev Akuila Yabaki ... denies the "contempt" charge. In a similar case, the New Zealand Law Society condemned the Fiji regime’s decision to charge a prominent civil society group and its chief with contempt of court. The Citizens Constitutional Forum (CCF) and director Reverend Akuila Yabaki had been charged over an article in the NGO's newsletter, Tutaka, which referred to a critical report on the rule of law in Fiji by the Law Society of England and Wales charity. In a Radio Australia Pacific Beat interview, Jonathan Temm, president of the New Zealand Law Society, said that in his opinion no crime has been committed. Justice Calanchini's sentence in The Fiji Times case has been reserved. 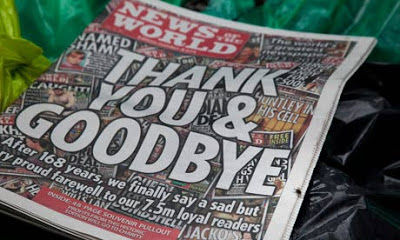 The 2010 Media Decree effectively forced the sale of The Times by the Murdoch-owned News Limited group to local newspaper director Mac Patel of the Motibhai Group because of an imposed 10 percent foreign ownership ceiling. Contempt is separate from the decree, of course. But although the regime's vindictiveness against the newspaper continues, the mitigation submissions clearly demonstrate that Times staff need a big brush up on potential media law traps. 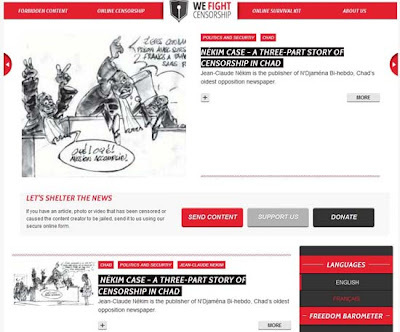 REPORTERS sans frontières (RSF - Reporters Without Borders) has launched a website called WeFightCensorship (WeFC) on which it will post content that has been censored or banned or has given rise to reprisals against its creator. This original website’s aim is to make censorship obsolete. It is an unprecedented initiative that will enable Reporters Without Borders to complement all of its other activities in defence of freedom of information, which include advocacy, lobbying and assistance. Content submitted by journalists or netizens who have been the victims of censorship – articles, videos, sound files, photos and so on – will be considered for publication on the WeFightCensorship site. “Reporters Without Borders is providing a deterrent designed to encourage governments and others to respect freedom of information, the freedom that allows us to verify that all the other freedoms are being respected,” Reporters Without Borders secretary-general Christophe Deloire said. By accessing a secured “digital safe,” Internet users will be able to submit content for publication anonymously. The website will also offer a “digital survival kit” with information about Virtual Private Networks (VPNs), encryption software such as TrueCrypt, online anonymization techniques such as Tor and other tools that news providers can use to protect their sources and, in authoritarian countries, their own safety. Private access to a beta version of the site has already been available since 13 November to those that register. To support the launch, the Publicis Bruxelles advertising agency devised a campaign ad free of charge that shows several heads of State, including Vladimir Putin, Mahmoud Ahmadinejad and Bashar al-Assad in their birthday suits with the legend “Totalitarian regimes will no longer be able to hide anything from us.” It will appear in the print media and online. Reporters Without Borders is an NGO with consultative status at the United Nations, UNESCO and the International Organisation of the Francophonie. It has its international secretariat in Paris, 10 international bureaux (in Berlin, Brussels, Geneva, Madrid, New York, Rome, Stockholm, Tunis, Vienna and Washington) and more than 150 correspondents across all five continents. The WeFC project is supported by the European Union’s European Instrument for Democracy and Human Rights (EIDHR) and the Paris City Hall. OPEN e-LETTER: Media reporting on Gaza: Nous accusons. WHILE countries across Europe and North America commemorated military casualties of past and present wars on Armistice Day (November 11), Israel was targeting civilians. On November 12, waking up to a new week, readers at breakfast were flooded with heart rending accounts of past and current military casualties. There was, however, no or little mention of the fact that the majority of casualties of modern day wars are civilians. There was also hardly any mention on the morning of November 12 of military attacks on Gaza that continued throughout the weekend. A cursory scan confirms this for Canada’s CBC, the Globe and Mail, Montreal’s Gazette, and the Toronto Star. Equally, for the New York Times and for the BBC. According to the Palestinian Centre for Human Rights (PCHR) report on Sunday, November 11, five Palestinian civilians including three children had been killed in the Gaza strip in the previous 72 hours, in addition to two Palestinian security personnel. Four of the deaths occurred as a result of Israeli military firing artillery shells on youngsters playing soccer. Articles that do report on the killings overwhelmingly focus on the killing of Palestinian security personnel. For example, an Associated Press article published in the CBC world news on November 13, entitled Israel mulls resuming targeted killings of Gaza militants, mentions absolutely nothing of civilian deaths and injuries. It portrays the killings as ‘targeted assassinations’. The fact that casualties have overwhelmingly been civilians indicates that Israel is not so much engaged in ‘targeted’ killings, as in ‘collective’ killings, thus once again committing the crime of collective punishment. Another AP item on CBC news from November 12 reads Gaza rocket fire raises pressure on Israel government. It features a photo of an Israeli woman gazing on a hole in her living room ceiling. Again, no images, nor mention of the numerous bleeding casualties or corpses in Gaza. Along the same lines, a BBC headline on November 12 reads Israel hit by fresh volley of rockets from Gaza. Similar trend can be illustrated for European mainstream papers. News items overwhelmingly focus on the rockets that have been fired from Gaza, none of which have caused human casualties. What is not in focus are the shellings and bombardments on Gaza, which have resulted in numerous severe and fatal casualties. It doesn’t take an expert in media science to understand that what we are facing is at best shoddy and skewed reporting, and at worst wilfully dishonest manipulation of the readership. Furthermore, articles that do mention the Palestinian casualties in Gaza consistently report that Israeli operations are in response to rockets from Gaza and to the injuring of Israeli soldiers. However, the chronology of events of the recent flare-up began on November 5, when an innocent, apparently mentally unfit, 20-year old man, Ahmad al-Nabaheen, was shot when he wandered close to the border. Medics had to wait for six hours to be permitted to pick him up and they suspect that he may have died because of that delay. Then, on November 8, a 13-year old boy playing football in front of his house was killed by fire from the IOF that had moved into Gazan territory with tanks as well as helicopters. The wounding of four Israeli soldiers at the border on November 10 was therefore already part of a chain of events where Gazan civilians had been killed, and not the triggering event. We, the signatories, have recently returned from a visit to the Gaza Strip. Some among us are now connected to Palestinians living in Gaza through social media. For two nights in a row Palestinians in Gaza were prevented from sleeping through continued engagement of drones, F16s, and indiscriminate bombings of various targets inside the densely populated Gaza strip. The intent of this is clearly to terrorise the population, successfully so, as we can ascertain from our friends’ reports. If it was not for Facebook postings, we would not be aware of the degree of terror felt by ordinary Palestinian civilians in Gaza. This stands in stark contrast to the world’s awareness of terrorised and shock-treated Israeli citizens. Bias and dishonesty with respect to the oppression of Palestinians is nothing new in Western media and has been widely documented. Nevertheless, Israel continues its crimes against humanity with full acquiescence and financial, military, and moral support from our governments, the US, Canada and the EU. Netanyahu is currently garnering Western diplomatic support for additional operations in Gaza, which makes us worry that another Cast Lead may be on the horizon. In fact, the very recent events are confirming such an escalation has already begun, as today’s death-count climbs. We wish to express our outrage at the reprehensible media coverage of these acts in the mainstream (corporate) media. We call on journalists around the world working for corporate media outlets to refuse to be instruments of this systematic policy of disguise. We call on citizens to inform themselves through independent media, and to voice their conscience by whichever means is accessible to them. A 10-minute video of a widowed mum teaching at a school for the blind, and surviving in a squatter settlement in Fiji's capital, Suva. The settlement known as Nanuku ... is one of many that have sprung up in the greater Suva area. The story of a woman who struggles to live in a two-bedroom house, with her parents, not accepted by her in-laws as well as earning very little and having to work multiple jobs, Anshoo is an inspiration to the many women who live in poverty-stricken parts of Fiji. This is development journalism - and good storytelling - at work. Congratulations Sherita and Sheenal! In fact, double congratulations for Sherita because she has just won the Gold Medal for the top USP journalism student for 2012. Café Pacific also takes the opportunity to applaud the journalism students for reviving Wansolwara Online. 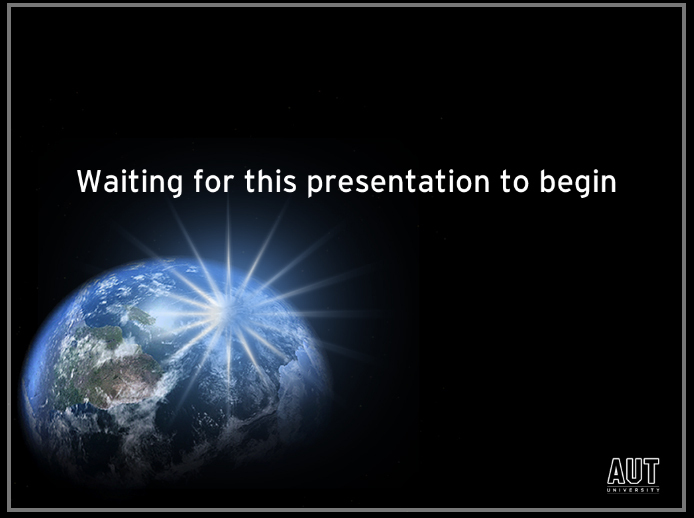 Not yet quite the finished product, but it is just good to be back in cyberspace after being offline since March 2007. The website follows an award-winning pedigree. Back in the 2000, the Wansolwara website (then known as Pacific Journalism Online, incorporating Wansolwara), won the international JEAA awards for Best Online and Best Publication (any media) for its coverage of the George Speight coup. In other words, the best produced by any journalism school in Australia, New Zealand and the Asia-Pacific region. Greek editor Kostas Vaxevanis (right): “My job is simply to tell the news and tell it straight. KOSTA VAXEVANIS hates being the centre of attention. On Thursday moments before taking the stand in one of the most sensational trials to grip Greece in modern times, the journalist said he was not in the business of making news. "My job is simply to tell the news and tell it straight," he averred. "My job is to tell the truth." Truth in the case of Vaxevanis has been a rollercoaster that has catapulted the 46-year-old from relative obscurity to global stardom in a matter of days. But, after a hearing that lasted almost 12 hours – with a three-member panel of judges sitting stony-faced throughout, he was vindicated: the court found him not guilty of breaking data privacy laws by publishing the names in Hot Doc, the weekly magazine he edits, of some 2059 Greeks believed to have bank accounts in Switzerland. "Journalism is printing what someone else does not want printed; everything else is public relations," Vaxevanis said, citing George Orwell, before observers packed into the crammed courtroom broke into applause. "As such it was my duty to reveal this list." Even before Thursday's court drama – proceedings that veered from comic to tragic as handcuffed Asian migrants looked on in bewilderment – the nation was up in arms over the list. In the two years since it had been handed to Greek authorities by the IMF's chief Christine Lagarde, the infamous tally of suspected tax evaders had caught the popular imagination. With tax avoidance widely blamed for the debt-stricken country's inability to balance the books, the failure of successive governments to act on the list and crack down on tax evaders had raised suspicions that corrupt vested interests ran to the top of society. "It is quite clear the political system did everything not to publish this list," said Vaxevanis, who had faced up to two years in jail and a €30,000 fine (£24,000) if convicted. "If you look at the names, or the offshore companies linked to certain individuals, you see that these are all friends of those in power. Phoney lists had also begun to circulate. It was time for the truth," he told the Guardian during a recess. "We live in a country where, on the one hand, tax evasion is rampant and, on the other, people are eating out of rubbish trucks because of salary cuts, because they can't make ends meet." Three years after Europe's worst crisis in decades erupted in Athens, Vaxevanis has emerged as an unwitting crusader – a defender of truth in an environment ever more electrified by the perceived menaces of malfeasance and mendacity. Five days after a public prosecutor ordered his arrest – dispatching special agents to seize the journalist in a nation whose justice system has almost never moved with such alacrity – there are few who do not agree that his trial has been "politically motivated". For defence witnesses such as the popular singer Dimitra Galani, bringing Vaxevanis before the court was proof that even press freedom was now at risk in the birthplace of democracy. "The whole thing is absurd, the theatre of the absurd. Greeks really don't know what to think anymore," she said. For veteran leftists such as Nikos Kostantopouloulos, one of the reporter's three lawyers, the affair was further evidence that the country at the centre of the continent's debt drama was falling down a very slippery slope. "We have a schizophrenic situation where, on the one hand, a journalist is being penalised for revealing a document in the interests of informing public opinion and, on the other, the parliament itself is now saying the handling of the list should be investigated." From the outset, said Kostantopouloulos, a former leftist politician, the case had defied the principles of justice. "Right down to the way the prosecutor so hastily issued the charge sheet without even bothering to stamp it, it has been handled very badly," he said. "Furthermore, none of those on the list have even filed a complaint about privacy violation." With ordinary Greeks hammered by a fifth year of recession, the case has ignited widespread fury. The list, reprinted on Monday by the leading daily Ta Nea, includes politicians, businessmen, shipping magnates, doctors, lawyers – a far cry from those who have borne the brunt of relentless austerity measures on the margins of society. "While we have been paying our taxes, some out there have been stashing their loot away in Switzerland, not being taxed at all," said Petros Hadzopoulos, a retiree, who had come to the court to get a glance of the journalist he called "his new, best hero". Hot Doc, which normally has a circulation of about 25,000, sold 100,000 last week. As Athens teeters once again on the brink of bankruptcy – its public coffers set to run dry in less than a month – Vaxevanis's arrest has highlighted the pitfalls of press freedom in a nation where this week alone two anchors on state television were also fired for publicly "undermining" a minister. The presenters' "crime" had been to question the failure of the public order minister Nikos Dendias to act on a threat to sue the Guardian for publishing a story alleging police torture of protesters that he said had "defamed Greek democracy". For those packed into the chamber it was clear that in the birthplace of freedom, democracy itself was at stake. Yesterday's often shambolic proceedings, which frequently saw the panel's presiding female magistrate thumping the bench as she demanded "silence" under an icon of Jesus Christ, included court-appointed interpreters being unable to translate with one confusing friend for French and absurd with illegal. "I am very pained to have to be here in Greece the mother of democracy explaining the obvious," said Jim Boumela, who, as president of the International Federation of Journalists, flew in from London to testify at the trial. "This is what I have to do in countries like Uganda," he said. "Kostas should be applauded for what he has done. 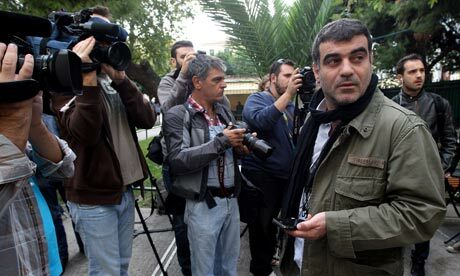 It's a very worrying turn that journalists are being suppressed in Greece – and I think we are going to see more of it." More than 500 individuals on the so-called "Lagarde list" of suspected tax evaders with secret bank accounts in Switzerland have been, or are currently, under investigation by UK Revenue and Customs for serious fraud. Tax investigators are still working their way through the 6000 names on the list, two and a half years after it was handed over to the UK by then French Finance Minister, Christine Lagarde, who also passed versions to other European members states, including Greece. An Al Jazeera news feed on the strike at Freeport mine in West Papua in October 2011 backgrounding the issues. Note that the clip is reported through a Jakarta "prism" rather than a Papuan one. CONGRATULATIONS to Auckland writer/photographer Karen Abplanalp who has won the Bruce Jesson Foundation’s $1000 Emerging Journalist Award for an outstanding investigation published in Metro magazine in December 2011 about the NZ Superannuation Fund’s investment in the Freeport mine at Grasberg in West Papua. 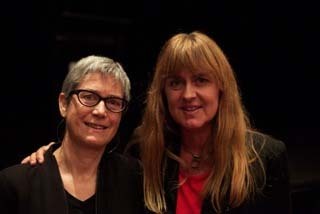 She was awarded the prize last night by foundation chair Professor Jane Kelsey. The article was written while she was a postgraduate journalism student with AUT University’s Pacific Media Centre and on the Asia-Pacific Journalism course taught by David Robie. 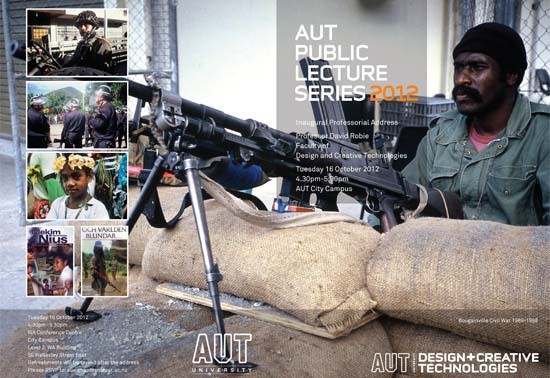 It was also featured in the May 2012 edition of Pacific Journalism Review. The Super Fund defended its investment to Abplanalp, arguing that it had a policy of “engagement” with the mining company to improve its ethical practices. But on September 26 this year the Super Fund announced that it had sold its $1.28 million investment in Freeport McMoRan because of “breaches of human rights standards by security forces around the Grasberg mine, and concerns over requirements for direct payments to government security forces”. It also sold much smaller investments in three other companies “for severe breaches of the fund’s responsible investment standards where engagement was unlikely to be effective”. The convenor of the Jesson Foundation’s journalism awards subcommittee, Camille Guy, said Karen Abplanalp’s article was a stunning exemplar of the crucial role of journalism in all countries of holding authority to account. “If Karen hadn’t investigated the true conditions behind the profits coming out of the Grasberg mine, it is unlikely that more than a handful of New Zealanders would have been aware of what their public pension fund was supporting. NZ Super Fund managers themselves probably did not know the full truth,” Guy said. The top Bruce Jesson journalism prize of $4000 for investigative journalism went to Christchurch journalist Rebecca Macfie for a planned book about the Pike River mine disaster. Macfie, the South Island correspondent for The Listener, has covered the Pike River story ever since 29 miners died on 19 November 2010 in New Zealand’s worst mining disaster in almost a century. 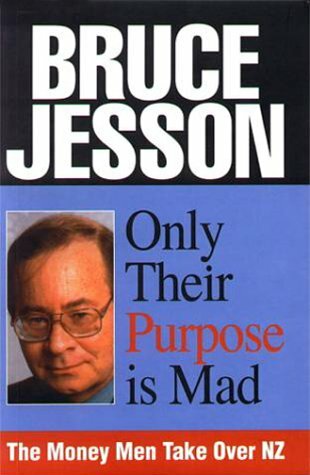 The Jesson journalism prizes, set up after the death of journalist Bruce Jesson in 1999 to support investigative journalism in New Zealand, will contribute $4000 towards Macfie’s costs of researching and writing an in-depth book on the tragedy for Wellington publisher Awa Press. Macfie will take leave without pay from the Listener to write the book, which will be published next year. BEHIND THE SHROUD, Selwyn Manning's long awaited documentary about "intelligence, espionage and counter-terrorism", is now available on DVD and public screenings are being planned. The Pacific Media Centre plans a showing early next year. The 105min documentary film is investigative, participatory, independent and "gritty in style". It examines the Ahmed Zaoui case. The film analyses why in 2007, after years of the New Zealand government stating the refugee Algerian theologian and teacher to be a risk to the nation's security, the Inspector-General of Intelligence and Security, Justice Paul Neazor, found in Zaoui's favour and set him free. 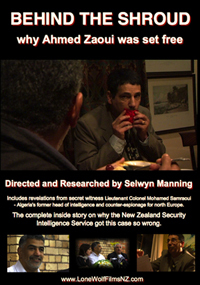 Behind The Shroud takes the viewer on a journey into that shadowy world of spies and espionage, and resolves the mystery of the Zaoui case through interviews with key players in the great game, including two secret witnesses who each testified at the Inspector-General's hearings into the Zaoui case in Auckland in 2007. The two secret witnesses are: Lieutenant Colonel Mohamed Samraoui, the Algerian regime's former head of intelligence and counter-espionage based in north Europe; and Professor George Joffe, an academic from Oxford and Cambridge universities - a renowned expert on north Africa affairs. Both men now speak publicly for the first time about how and why Zaoui was framed by the Algerian regime. Mohamed Samraoui is a protagonist of sorts and is presented as the officer tasked by his superiors to create a cloak of disinformation around Zaoui. He outlines why as an officer of the DRS (Algeria's secret intelligence service) he "disempowered" Zaoui and other members of Algeria's opposition political parties so as to render them ineffective threats to the military regime.Behind The Shroud also presents other experts who offer exclusive accounts, each giving a unique view on how the Zaoui case has become a precedence-setting case-study into whether it is proper for governments to rely on intelligence information in judicial process and practice. These experts include: Lieutenant Colonel Andrew Wilkie, a former Australian Defence intelligence officer and intelligence adviser to former prime minister John Howard; Dr Paul Buchanan, a former security analyst to United States intelligence/security agencies;Superintendent Gerry Cuneen, New Zealand Police's former head of its criminal intelligence unit; Matt Robson, former associate minister of foreign affairs; and others. Their testimony confronts unanswered questions that have lingered since late 2007 and explains why the New Zealand government suddenly set Zaoui free, inviting Zaoui and his family to enjoy their liberty as legitimate refugees in New Zealand. The documentary concludes with a thought-provoking critique of New Zealand's intelligence apparatus and paves the way for a debate into how New Zealand can move to ensure the Ahmed Zaoui case is not repeated. Behind The Shroud is being distributed for selected film festival release. THIS MUST go down as the rugby union try of the year, surely. France winger Yoann Huget, grabbed this remarkable score on March 28 in the French Top 14 championship playing for Bayonne away against Montpellier. After a brilliant intercept, he ducked and weaved his way almost the length of the field, kicked ahead, smothered the last defender - who had the ball - regathered and then scored. Magnifique! In spite of this, his team Bayonne lost against Montpellier 26-37. Huget is now playing for French champions Toulouse. A 10-minute Metro TV news feed of Indonesian police shooting at protesters. JAKARTA GLOBE stringer and SuaraPapua.com reporter Oktovianus Pogau was choked and beaten by Indonesian police as he attempted to report on a West Papuan protest. Indonesian police opened fire on protesters in Manokwari, West Papua, shooting two and wounding three others — including a Jakarta Globe contributor — in the latest crackdown on pro-independence groups in the restive Melanesian province, reported Pacific Scoop. The independent West Papua Media reported four people had been shot. Indonesian police denied the shootings, which were graphically videotaped by Metro TV. The Southeast Asian Press Alliance (Seapa) has protested over the assaults against journalists in Indonesia. Tuesday morning’s West Papua National Committee-sponsored (KNPB) rally began near the State University of Papua (Unipa) in Manokwari, said human rights activist Markus Haluk. About 300 protesters attempted to march to nearby Borarsi field when police and the Indonesian Military (TNI) blocked their path. Pogau was videotaping the scene when he was approached by a plainclothes officer and told to leave, according to the Jakarta Globe. When he refused a second officer attacked him from behind. “[A] policeman in a uniform came and choked my neck while he threatened me and told me to leave the location,” Pogau said. Pogau was pulled from the scene by fellow journalists. He showed the officers his press credentials before the second attack took place. It was the second assault on journalists in Indonesia in the past week. On October 16, members of the TNI attacked five journalists reporting on a downed military aircraft in Penkanbaru, Riau. Riau Pos photographer Didik Herwanto was beaten and choked by an officer with the Indonesian Air Force in a widely spread video. The attack sparked widespread condemnation in Indonesia. Lt. Col. Robert Simanjuntak later apologised. Pogau is the second Jakarta Globe contributor to be injured on the job while reporting in Papua. Last year, long-time writer Banjir Ambarita was stabbed in Jayapura after reporting on allegations of sexual abuse of female inmates by officers in a Jayapura police detention centre. Ambarita survived the attack but said the stabbing left him “deeply traumatised” and wary of reporting on government abuse. In 2011, two journalists working in Papua were killed, according to the Pacific Media Freedom 2011: A status report by the Pacific Media Centre. Eight were kidnapped and 18 others attacked during the course of their work. Foreign media are banned from reporting in Papua without a special permit. In 2011, only three foreign media outlets were granted approval. 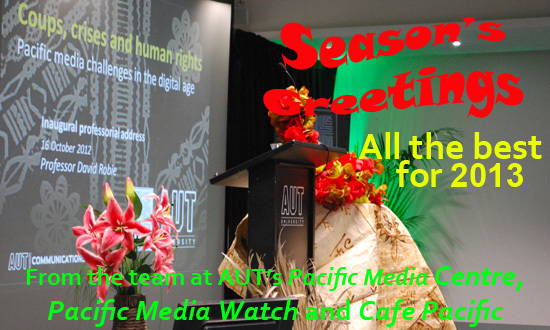 PROFESSOR DAVID ROBIE is director of the Pacific Media Centre in AUT’s School of Communication Studies and editor of the international peer reviewed journal Pacific Journalism Review. He holds a PhD in History/Politics (2004) from the University of the South Pacific, Fiji. He has lived and worked as an international journalist and media educator in seven countries for more than four decades. In this professorial address, Professor David Robie reflects on the challenges in the context of the political economy of the media and journalism education in the Asia-Pacific region. He also explores emerging disciplines such as deliberative journalism, peace journalism, human rights journalism, and revisits notions of critical development journalism and citizen journalism. ‘Desperate’ search for online business media model, but what about public trust? News organisations have mostly reacted defensively about media "regulation"
ONLINE media business models will succeed only if news organisations put more effort into regaining public trust, says Pacific Journalism Review in its latest edition, reports Pacific Media Watch. In an issue devoted to the Leveson inquiry into Britain’s News of the World phone hacking scandal and the Finkelstein and Convergence reports on the Australian news industry, the research journal has questioned the “increasingly desperate” search for a business model. “Is the new model the only answer to the current plight of journalism?” writes edition editor Dr Johan Lidberg from Monash University in Melbourne. It is as important to retain public trust in journalism and to rebuild lost trust as the quest to make online journalism pay, Dr Lidberg writes. “Indeed, without, or with low, public trust in news media, will online journalism ever pay enough to sustain quality journalism?” he asks. One important tool to retain and rebuild trust in any professional practice is openness and accountability. Along with the British and Australian media crises, the journal also examines NZ Law Commission proposals for media accountability reforms. “The NZ media has not yet demonstrated anything like the excesses that have been the focus of the Leveson inquiry,” comments media law analyst Linda Clark. Contributors to this edition include professors Wendy Bacon, Duncan Bloy, Rodney Tiffen, Mark Pearson and Denis Cryle (an assessment of Rupert Murdoch’s flagship newspaper, The Australian, two decades on). Dr Lidberg, who also contributes an article about Australian media attitudes to accountability, was assisted for the edition by Professor Chris Nash and managing editor Professor David Robie. He said he hoped the issue would be the beginning of an ongoing debate where media practice accountability would be elevated to the same level as media regulation. It is a theme for the annual conferences of both the Journalism Education Association of Australia (JEAA) and Journalism Education Association of New Zealand (JEANZ) next month. Professor Wendy Bacon has also contributed an article for the new Frontline section of the journal devoted to a “research journalism” strategy in an academic environment. “Over the last two decades, the history of journalism research in universities has been a dynamic and intellectually rewarding one,” writes Bacon, who is editor of Frontline. PNG Prime Minister Peter O'Neill's EM TV interview on West Papua. NEW ZEALAND’S public pension fund has stunned the human rights fraternity monitoring the recent upsurge in West Papua violations by Indonesian security forces in West Papua by pulling out more than $1 million in investment from the US-based copper and gold mining giant Freeport-McMoRan. The $15.7 billion NZ Superannuation Fund announced it was ending investment in four companies that were violating international ethics standards. The fund decided to can its Freeport investment in the wake of persistent allegations of human rights offences committed by security forces around the company’s controversial Grasberg mine. But the Auckland-based Indonesia Human Rights Committee and a young photojournalist affiliated with the Pacific Media Centre can take a bow for their contribution to the change of heart by the super fund. 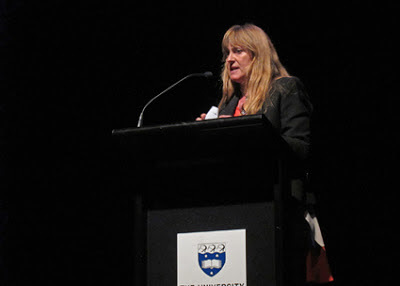 The IHRC has been an ardent campaigner against the investment while Karen Abplanalp, then a postgraduate student at AUT University, carried out a major investigation of the mine and the New Zealand connection as part of her Asia-Pacific Journalism coursework. Her article was worked up into the lead investigative article, entitled "Blood Money", in Metro magazine in its December edition. This gave a major public profile to an issue that had previously been “hidden”. If that wasn’t a big enough setback for the Indonesians in the global credibility stakes over its failed West Papua policies, Papua New Guinean Prime Minister Peter O’Neill declared that he was going on the front foot by applying diplomatic pressure on the Indonesians over the human rights violations against their Melanesian brothers. New Zealand’s public pension Superfund stand against alleged Indonesian government security forces breaches of human rights is making a mark around the world. The story has been covered by international media and hit the front page of Indonesian news website the Jakarta Globe, with the headline New Zealand fund pulls Freeport investment, cites Papua rights offences. It is the first time a government fund has made statements linking Indonesian security forces, corruption and human rights abuses. 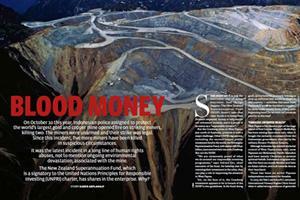 The NZ Superfund (NZSF) and its investment in the US-owned mining giant Freeport McMoRan’s Grasberg mine were the subject of a major Metro investigation last December written by me while I was a postgraduate communication studies student at AUT University. At the time, the fund was adamant that it would not divest from Freeport and that the mining company was meeting the fund’s responsible investment standards. What has changed then for NZSF since the Metro investigation? NZSF’s head of responsible investing Anne-Maree O’Connor replied to Pacific Scoop: “We have had more time to continue our engagement with a number of companies on our portfolio and to review the resources we have to commit to engagement, and look through which companies we would likely have success with engagement, which ones we needed to draw a line with that we should not pursue engagement because we did not feel that would could generate enough change given our resources and our holdings in the company." The NZSF statement said: “Freeport-McMoRan has been excluded based on breaches of human rights standards by security forces around the Grasberg mine, and concerns over requirements for direct payments to government security forces by the company in at least two countries in which it operates. NZSF has investments with RioTinto, which owns 40 percent of Freeport McMoRan – does this mean that NZSF will divest from Rio Tinto also? It will be interesting to see if other crown financial institutes follow suit. The Government Pension Fund and the Earthquake Commission also have investments in Freeport McMoRan. The Auckland-based Indonesian Human Rights Committee (IHRC), which has long campaigned against “unethical” investment in the mine, met with the NZSF to thank the fund for its decision to divest from Freeport McMoRan. IHRC chair Maire Leadbeater said the meeting went “extremely well”. Leadbeater told the staff they were really pleased about the decision, and told them about the kind of response they were getting from around the world. Indonesia and Timor-Leste campaigner Josef Benedict from Amnesty International said the agency continued to receive “credible reports” of human rights violations committed by the security forces in the neigbouring provinces of Papua and West Papua. The reports included allegations of torture and other ill-treatment, unnecessary and excessive use of force and firearms and possible unlawful killings. “Investigations into reports of police abuses are rare and only a few perpetrators have been brought to justice,” he said. Amnesty International believes that the lack of independent and impartial monitoring of human rights in the West Papua region contributes to a “climate of impunity”. In a response statement to Pacific Scoop, Freeport-McMoRan made the same assertions that the NZSF had made to the original Metro investigation but were discredited in that report. “We are disappointed in the New Zealand Superannuation Fund’s decision to exclude Freeport-McMoRan from its portfolio based on claims of breaches of human rights abuses by PT Freeport Indonesia (PTFI), a Freeport-McMoRan subsidiary,” said Eric Kinneberg, the company’s external communications director. The statement said Freeport-McMoRan had cooperated with the Indonesian government in its role of maintaining public order, upholding the rule of law, and protecting company personnel and property. “The police are assigned via a presidential decree to protect the Grasberg mine site, which has been categorised as a national vital asset,” Kinneberg said. 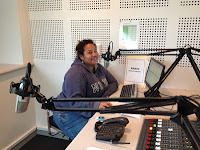 Karen Abplanalp is an Auckland photographer, writer and contributor to Pacific Scoop. SO WANSOLWARA finally has its own new-look Facebook page (three days old), with a revival of its online edition coming along soon (promised for a good while now). Excellent move. The original Pacific Journalism Online website student team at USP scooped the pool in the Journalism Education Association (JEA) awards that year and were treated to a standing ovation at Moolaabaa, Queensland, for their coverage of the George Speight putsch in May 2000. International journalism standards? Yes, they started way back - far more than a decade ago. Pity the USP journalism website slipped into disuse in March 2007. But good to see an online version of Wansolwara finally returning alongside its newspaper edition, printed by the Fiji Sun. Congratulations Sherita and Sheenal Sharma and their team. Wansolwara has been publishing for 17 years now. Has any other Pacific (or NZ) journalism school matched that? Never. (I notice the newspaper has recently dropped the list of international awards it has won - too much "global" evidence for some?) Radio Pasifik has a strong history too and great to see the revival there with Semi Francis and his team. It is also great to see the USP Journalism students and graduates bag prizes in the Development Asia Environment Awards. Well done - and especially Fiji TV team leader Anish Chand! (Even though this belated praise actually refers to awards in 2010). JOURNALISM educators in the Pacific have called for more and better industry incentives and collaboration with journalism schools as a way of improving reporting standards. A robust debate at the University of the South Pacific among experienced journalism educators revealed that improving the quality of education was an ongoing task. But it could be helped if journalists had some motivation to stay in the job, instead of moving to higher paid global NGOs. A former head of journalism at USP and current PhD candidate at the University of Queensland, Shailendra Singh, said he observed a “plethora of writing” and a “diversity of views” in the Australian media that was lacking in Fiji. “In Australia, there are bald-headed and pot-bellied journalists. Fiji doesn’t see that due to a high turnover of staff,” he said. USP's Radio Pasifik manager Semi Francis confirmed that media organisations in Fiji employed students straight from school, overlooking university graduates. Lecturer Misa Vicky Lepou from the National University of Samoa, and a onetime graduate from USP, said it was the same in Samoa. She confirmed there were many schoolleavers in journalism competing with graduates, and their "substandard work" was noticeable. She said the industry still criticised the journalism school for the poor level of journalism among young reporters. Dr Marc Edge, current head of journalism at USP, said he was there to “increase the standard of journalism not just in Fiji, but across the Pacific”. “It needs to improve. Grammar, subject-verb agreement, style, little things like this need to improve considerably,” he said, adding that he too was still learning about the region, having arrived from Canada fairly recently. He said low staffing at USP in recent years had not helped. However, Pacific Media Centre director Professor David Robie responded that the journalism schools at USP and at the University of Papua New Guinea had achieved a lot on the international stage, particularly with USP’s success with the award-winning newspaper Wansolwara. “At that stage in the 1990s, no New Zealand journalism course had a regular newspaper. We [at AUT University] do have today Te Waha Nui, which I started with a colleague after I came from USP, on the basis of the experience at USP. Dr Robie also pointed out that Wansolwara integrated the "commercial reality" of producing a paper, unlike most other journalism schools, which were typically funded by the university or school. Singh was also concerned to point out that there was much hard work done on the paper in previous years, which had continued under the work of former Fiji Times journalist Irene Manueli. A resounding round of applause broke out. Dr Edge remained optimistic about the quality of future USP graduates. “The first-year students we have this year are incredibly bright. They are as bright as any students I have taught anywhere in the world,” he said. But Singh reminded Dr Edge that there had been great achievements in the past. Professor Robie also said Australia and New Zealand could learn from USP, as its internship period was six weeks, while AUT internships were only two weeks and far too short. He said journalism schools needed to train students in an ever-increasing range of complex skills. 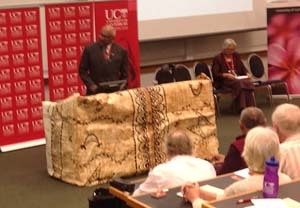 He spoke about giving students practice in real reporting of "live" events against deadline pressure such as AUT's Pacific Media Centre has done with the Pacific Scoop coverage of the Pacific Islands Forum in the last three years. He said AUT was focusing on producing “well-rounded graduates with critical thinking skills, strong exposure to business, economics, environment, government, history, politics, human rights and culture. In the Fijian context, Singh said there was a need to distinguish between responsible journalism and self-censorship, which was of growing concern in Fiji. “More cautious, more responsible and more circumspect, doesn’t mean self-censorship,” he said. Dr Edge said USP was looking to begin a postgraduate diploma in digital journalism in the near future, as well as an option to undertake a master’s degree. In past years, USP had a postgraduate journalism programme and there have been graduates but this was dropped two years ago because of USP funding cuts. Alex Perrottet is contributing editor of Pacific Media Watch. He was at the USP symposium as both a a reporter and as a research paper presenter.